Discover a minion; or Discover a spell. Was petrified when it found out it didn't make the cut for Azerothian Idol. I miss this card so much, wish this and Living Roots were in standard. I want to replace the raven idol with another spell, what spells do you indicate? this card is bad for me because it never gives me what I want. This card alone makes Fandral Staghelm a ubiquitously used card in Druid. Among all of the Choose One cards, this one (A) is a spell rather than a minion (so getting both effects essentially doubles the card's power), (B) is a card that is useful on any board state despite being a spell (unlike Wrath), (C) is cheap and therefore extremely easy to use the turn you play Fandral, and (D) is still good without Fandral. This card is the peak of versatility, particularly for people with small collections who have no other way of obtaining some cards. Discover, to me, looks like the most balanced, new-player friendly mechanic in the game right now. "having a number of different forms, purposes, meanings, aspects or principles." Thanks for getting me to legend. -Great in Middle/ramp/ control druid. First i only use one , after get it in 3 games i decide to include the second. -it ocuppied my free slot ( i always have one in each deck to improve) and subtitues a Wild Growth for the second slot. only one wild grow on the deck. -99% time you choose a spell. Not only in the begining of the game but also in late game.Works well in both. Consider it a Tutor card ( like MTG) With the advantage that is a "extra copy". -One of the "bad" choices is the idol itself ( gets out morethat i thought) Starfall or a Nourish.Even so they prove useful. Even a healing touch can salve you theday. -Dont feel forced to use it as youdraw it. one thing is a turn one. Use it but itget a second don use it till you need a especific effect. I predict that this will be used to discover a spell at least 80% of the time. Why? Because even though there are a lot of good druid minions, there are at least 4 times as many neutral minions so you'll still see those more often. If you are looking to fill out a certain spot in your curve then there's no guarantee you will get a minion of that cost, and if you do there's no guarantee it will be any good. Druid spells on the other hand are also generally good and more adaptable to the situation so it's a safer choice most of the time. The best aspect of this card is probably the fact that it gives you up to 4 potential copies of Swipe in your deck, which is just a great way to destroy aggro decks. Overall, from how much I’ve tested, is a GOOD druid card as a whole, but is a GREAT ramp druid card in particular. Aggro druid generally won’t get the cards they want and they often don’t have the room to run that kinda stuff without deck dilution. In Ramp, it’s simpy insane. You can essentially choose a card ON THE SPOT for your particular situation for nearly free (ramp druids almost always have SOME mana to spare at SOME point). Would expect to become popular soon, especially with Arena players. Well spell-wise it can only be druid spells, minion wise its ANY minion yes, but class cards have a 4x~chance to appear from discover according to Ben Brode on twitter, so druid minions are more likely to appear and Druid minions are strong. for 1 cost it seems pretty good, token druid will probably use this, its a cheap trigger for violet teacher that can generate more spells. With this card you can only DIscover spells and minions that are Neutral or Druid, these cards can be from any mana value and they have to be collectible. Works the same as every other Discover card. Class and neutral only. Yo dawg, this is X to the Z , Xzibit. I HEARD you like to "choose one." SO we decided to give you the option at only 1 mana cost. I play druid sometimes so im not like ruined by this amazing card but why not give something to ease the pain on some other classes( cough cough shaman ) i see this for shaman as " Totem tribute" 1 mana. . "discover a shaman card. it costs 2 less"
Raven Idol ---> Animated Armor ---> Master of Disguise. I am going to play with this and Ethereal Conjurer in my Mage decks. 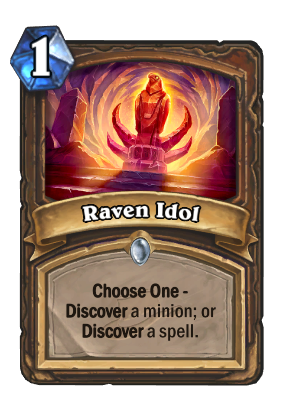 Raven Idol is a Druid card and you can only get class-specific and neutral cards from it.